Holds up to 46 bottles So you can easily keep your wine collection chilled. Soft-touch electronic controls with amber LED display Allow you to adjust the temperature from 40° to 65° and monitor the actual temperature. 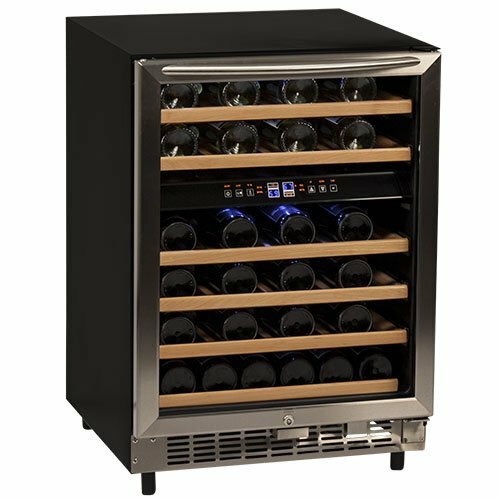 2 temperature-controlled zones Let you maintain different temperatures in the cooler's 2 sections, so you can store your red and white wines separately. Wooden shelves with pull-out roller assembly Make it easy to access the bottle you want. Some of the shelves accommodate burgundy bottles. Reversible, double-pane tempered-glass door Lets you view the contents and allows left- or right-handed opening. The stainless-steel frame and top-mounted handle add a stylish touch. Built-in or freestanding design Enables flexible placement. Cool LED interior display lighting Illuminates the contents. A switch allows you to turn the lighting on and off. Indicator lights For red, white and sparkling wine keep you apprised.